Autumn marks the beginning of cooler weather, leaves falling from the trees, and of course the extremely popular pumpkin-flavored coffee. As the weather cools down, it means less and less time will be spent outdoors relaxing or eating on patio furniture. Before it gets too cold, it is time to think about moving seasonal items like patio furniture and outdoor grills into storage. Fall is a great time to prep these items and place them in storage for the winter months. If you prepare them properly, then you will be able to set them up easily in the spring and summer. If you decide to store patio furniture or a grill outside throughout the winter months, it is important to have it covered with water tight coverings. Remove the fabric cushions from the furniture and place them in a fully sealed outdoor storage container. As an alternative, putting your patio furniture into a self storage unit, such as one of our storage units in Atlanta, while keeping it out of the elements can help prolong its life. If you follow a few preparation steps before storing your patio furniture, then you can easily assemble and reuse it again in the spring. Check with manufacturer’s instructions before starting to clean your outdoor furniture and placing in storage. 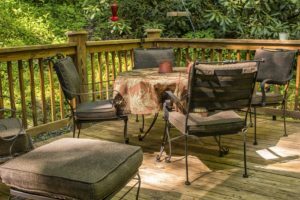 Before you place your outdoor grill or patio furniture in storage, closely examine the tables, chairs, and patio umbrellas to see if anything is broken or needs repair. If the patio furniture looks like it cannot be fixed, then it is time to get rid of them. After you examined the items and determined if they are ready for storage, the next step is to thoroughly clean the furniture before placing it in storage. Remove and wash the cushions and wipe down all surfaces of the chairs and tables. Wash wicker, mesh or plastic and wrought iron chairs with a solution of dishwater soap and water. Use wood oil soap on wooden furniture. Clean the fabric or canvas cushions with a solution of Lysol and hot water. Let the furniture dry completely after rinsing off the cleaning solution. The cushions should be completely dry before storing to prevent mold and mildew growth. To keep the furniture protected, wipe the wicker or wood furniture with a furniture grade wax, aluminum or plastic furniture with a car wax and metal furniture with a silicone sealant spray. Clean patio umbrellas according to manufacturer’s instructions. Cleaning canvas usually requires brushing to remove dirt and then cleaning with warm water and mild soap. The patio umbrella should be completely dry before storing. The patio umbrella’s wooden frame can be cleaned with wood polish or wax. In a storage unit, stack patio furniture chairs on top of one another to gain extra storage space. To save more storage space, remove the legs of the patio table while in storage. Keep the screws and nuts for the table together in a plastic bag attached to the legs. Just like patio furniture, an outdoor grill must be properly prepped before going into storage for the winter months. Following tips on how to clean and store an outdoor grill will allow for continuous use after the cold months. For grills with propane tanks, consult with the owner’s manual for the grill before disconnecting the propane from the grill. Shut off the gas source, before removing the tank from the grill. Do NOT store the propane tanks in your storage unit with the grill. For winter storage, disconnect the tank and store it outside of your home in an upright position away from dryer and furnace vents and children’s play areas. To clean a grill, use a wire brush or steel wool to clean off any cooked-on food or grease. Clean and empty the ash pan, drip pan and burner shield. The grill needs to be thoroughly dry before placing in storage. If you are storing a charcoal grill, remove and properly dispose of the charcoal before storing. Cover the stored grills with waterproof grill covers while in storage. Storage World has a variety of self storage units to help you store your patio furniture for the winter. From climate controlled to non-climate controlled and sizes ranging from 5×5 to 10×30, our home storage solution is a great option to store your outdoor grills, tables, chairs, umbrellas and more until you’re ready to bring them out again.